Three layers of chocolate fudge cake with fluffy mascarpone chocolate frosting, dark chocolate glaze, and crispy chocolate pearls for Style Sweet CA's 4th blog anniversary! STYLE SWEET CA turns 4!! I can't recall the exact date of my very first blog post. Sometime four years ago I went from bakery website to food blog. I used to post pictures of the custom cakes I'd make for clients, but a big move from California to Vancouver changed everything. My clients turned to readers, my recipes scaled down for the home baker, and I taught myself how to use my digital camera. The first couple years I spent navigating the ins and outs of blogging, making some horrendous decisions with props and food styling, and a few how-to decorating posts that gained the blog some early attention. However, as soon as I started to establish this space, I switched gears and wrote my first cookbook. Since then, I've rediscovered my voice and have been really enjoying writing and photographing the delicious stories you see here. 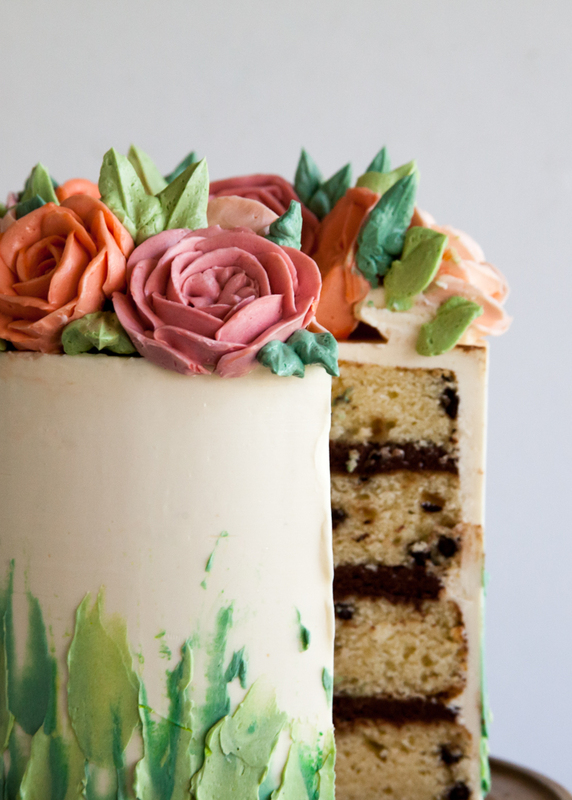 "A cake and pastry blog for the home baker." What does that really mean? To me, it means taking my knowledge, experience, and expertise and sharing it in an easy to understand, approachable way. It is inspiring others and hopefully getting you guys jazzed about a particular pie recipe, frosting technique, or cake design. It is beautiful imagery that excites you enough to want to recreate the dish yourself. It is going back to some of the basics and understanding why we do certain things in the kitchen to yield tasty results and learning a trick or two that turns a daunting pastry project into something you can actually see yourself making at home. Have I stuck to this mission throughout every post over the last four years? Probably not. But I try! But before we see where year 5 will take us, let's dive into this Tripe Chocolate Cake - I know you're dying to grab a fork. In the end, I picked a cake that I wanted to eat. Chocolate. And lots of it. I went with a solid, trustworthy chocolate cake and a mountain of mousse-like milk chocolate frosting that tempts you to lick your screen. Is it working? Do you want to faceplate right into those cocoa clouds yet? But really, what I mean is, I went with a chocolate cake recipe that is perfectly moist without being greasy, tender, and deeply chocolatey. I tried a few variations, but most of the others ended up in the compost bin. The thing is, I was trying too hard! I'd strayed too far from my base recipe instead of making small tweaks here and there to improve a recipe that already works. No need to reinvent the wheel every time! This Chocolate Fudge Cake recipe is based on the Sour Cream Chocolate Cake from my cookbook, Layered. I've made some slight changes (see Notes) and added a bit more chocolate. The method has also been slightly altered as well. This new way just makes more sense. Most chocolate cakes are heavy and dressed in deep fudge frosting or thick ganache. I wanted to off-set the rich cake with fluffy frosting - especially since it's summer and this cake will be competing for your attention from all the strawberry and stone fruit pastries out there right now. For the frosting, I lightened up my favorite Swiss meringue buttercream with creamy mascarpone and melted milk chocolate. It is so heavenly and cloud-like! I beg you though, please eat this cake at room temperature! Oh, and I tossed in a couple handfuls of some chocolate crunchy pearls for texture (totally optional). For the third element in our Triple Chocolate Cake - dark chocolate glaze. If you are so tired of drippy cakes by now, please forgive me! I still think there is a time and place for chocolate glaze, and I hope you will agree that it totally works with this cake. As always, the perfect drips are a matter of temperature. It helps to chill the cake so that the cold buttercream helps control the speed of the drip. If you still aren't sure, then simply try a test-drip on the back of the cake. If it runs off the cake and on to the cake board, the glaze is probably too warm (chill at room temperature). If it is blobby and doesn't quite drip, simply re-heat it! Pre-heat oven to 350 degrees. Butter and flour three 6-inch cake pans and set aside. Place the chopped chocolate, cocoa powder, and espresso powder in a heat-safe bowl. Carefully pour over the boiling water. Stir together until smooth and set aside. Using an electric mixer (hand or stand), mix together the oil and sugars. Add in the vanilla and eggs, one at a time. Scrape down the bowl. Add in half of the flour mixture and mix on low until combined. Add the yogurt and buttermilk and mix until smooth. Add in the remaining flour and mix until combined. With the mixer on low, carefully stream in the melted chocolate mixture until combined. Evenly divide the batter between the prepared pans. Bake for 26 to 30 minutes or until a toothpick inserted into the center of the cakes comes out clean. Cool on a wire rack for 10 to 20 minutes before removing the cakes from their pans. Place the egg whites and sugar in the bowl of an electric stand mixer. Whisk by hand to combine. Fill a medium saucepan with a couple inches of water and bring to a simmer. Place the mixer bowl on top of the saucepan to create a double-boiler. Whisking intermittently, warm the egg mixture until it reached 160 degrees on a candy thermometer. Once hot, carefully replace the mixer bowl back on the stand. Whisk on high speed until stiff peaks and the outside of the bowl returns to room temperature (about 8 minutes). Turn the mixer down to low and add in the butter and mascarpone, a couple tablespoons at a time. Stop the mixer and swap the whisk for the paddle attachment. This recipes makes a very small amount of chocolate glaze and cooks up rather quickly (i.e. - don't walk away from the stove). Combine the chocolate, cream, and corn syrup in a small saucepan. Place over medium heat until the chocolate begins to melt. Remove from the heat and stir until completely melted and combined. Stir in the salt and bourbon (if using). Cool at room temperature before dripping on the cake. Trim the cooled cakes with a long serrated knife. Place the bottom layer on a cake board or serving dish. Spread on about 3/4 cup of the milk chocolate frosting with an offset spatula or the back of a spoon. Sprinkle on a handful or two of crunch pearls (if using) and gently press them into the frosting. Top with the next layer of cake and repeat. Crumb coat the cake with the frosting and chill in the refrigerator for about 15 minutes before adding the glaze. Once both cake and glaze are at the appropriate temperatures, drip the chocolate over the edge with a spoon. Pipe on remaining frosting with a large star tip and decorate with chocolate sprinkles. – Replace the instant espresso and boiling water with strong, hot coffee. You will not be able to taste the coffee flavour in either scenario, but the coffee does enhance the chocolate. If you'd prefer to leave the espresso/coffee out all together, that is fine too. – Instead of Greek yogurt and buttermilk, replace with 3/4 cup sour cream. Alternatively, replace Greek yogurt and buttermilk with plain whole milk mixed with a tablespoon of fresh lemon juice. Stir the lemon juice into the milk before you prep any of the other ingredients. By the time you add it to the batter, the milk will appear curdled. That's OKAY. – If the buttercream looks like it has cuddled, the butter was probably too cold. Just keep mixing. – If the buttercream looks soupy, you probably added the butter in too soon and before the meringue returned all the way back to room temperature. Chill the mixture (inside the bowl) in the fridge for 15 minute and try whipping again until smooth. – The buttercream recipe will make enough to fill and fully frost a three-layer 6-inch cake. If you only give it a semi-naked crumb coat (as I've done here), then you will have leftovers. I must admit, I have a love-hate relationship with pears. When they are ripe, they are the most beautiful, juicy, and flavorful treats. Any other time, they fall completely flat. For this recipes, I decided to put our differences aside, and give some TLC to some beautiful BC pears. When it comes to the dessert menu, I hardly ever understood why anyone would ever chose a poached pear or cheese plate over decadent cheesecake or gooey chocolate cake. While I still don't know why cheese finds its place among these sweet treats, I think I finally understand the beauty of a poached pear. Taking the time to basically make a sweet, cinnamon-y jacuzzi for your pears definitely pays off. Poaching pears definitely alleviates some of that heartache when they are not perfectly ripe. The pears become sweet, tender, and can be infused with whatever flavor you'd like. Plus, it will leave your kitchen smell absolutely amazing! Although you might be tempted to eat the poached pears right out of the pot, pairing them with cranberries in this layer cake makes for the perfect fall treat. The sweet tang of fresh cranberries is brilliant in a spiced layer cake. The added cinnamon and cardamon create warmth in every bite. If you don't know about mascarpone, you will be in for a big surprise. Think of this frosting as cream cheese icing's more elegant, older sister. And trust me, this Cranberry Pear Cake calls for nothing less. Head on over to The Cake Blog for the full recipe!